With September being the driest in a long time, it was only right that the rain should come on the 3rd of October, the day before the race. However when marking out the course, the ground was very firm and only the boggiest spots remained wet. Increased activity in the forest has lead to some path improvements on the way up to the poles and only short sections of the rough zig-zag path remain narrow. Race day turned out to be another glorious morning in the Sperrins. In the men’s race it was Alex Brennan who was lining up as pre-race favourite, however some of the new faces meant Brennan still had to be on his toes. 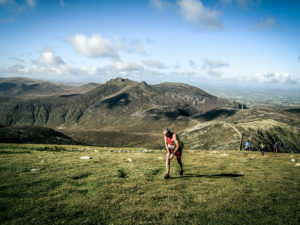 Local men, Acorn AC’s Shane Donnelly has shown continuously improving form in recent mountain race and Magherafelt Harrier’s Mark McGinn knows this mountain as well as Brennan, however this was his first time racing it. It was great to see Acorn AC’s Karen Alexander toeing the line again and with Lagan Valley’s Shileen O’Kane beside her, it was going to be a race from the start. This time it was Nuria Hernandez who hails from Spain who added to the mix. From the whistle blew, Brennan set the pace. The first section is through forest trails, a fast section before hitting the hill. After the initial climb it was Brennan who got to the poles first with a sizeable gap to Belfast Running Club’s Lochlainn Connolly, closely followed by Donnelly. In the ladies race, O’Kane was running strong uphill and was fending off Alexander considerably. Over the stile and on to the rough open mountain, the loop takes runners down the other side before a steep climb to the summit. Positions started to change, those who favour the rough downhills took their turn to battle it out with the strong climbers. With places being traded behind, Brennan continued on his one man mission, summiting first. At the finish line it was Brennan who cruised home in a time of 41:11, in excellent form, this was enough to have beaten 2013 winner Alan Bogle’s time of 41;54, but not quite enough to catch his team mate Johnny Steede’s 2012 time of 40:29 (the author couldn’t possibly let him get away with only praise!). Let’s hope he keep the form up and maybe next year we could see a clash of the titans! Behind him it was change as Donnelly took a clear 2nd in 43:41 (also first local), with Ballymena Runners’ Connor Reid taking 3rd in 44:15 after a strong mountain section. In the ladies race, change was in the air, Alexander had found her legs after the shaky start and opened almost a minute on O’Kane for a convincing win in 46:37 and with O’Kane coming in 47:20 . Ballymena Runner’s Susannah Allen came 3rd in 63:06. Thanks to everyone who helped out and thanks to everyone for coming, hopefully we will see you all again next year. An apology for Eugene McCann, the girls taking registration were convinced he couldn’t possibly be over 50 and so he was overlooked for the V50 prize, however fate stepped in and he took home a spot prize instead!